Citation Information: J Clin Invest. 2003;112(6):902-914. https://doi.org/10.1172/JCI18337. To detect and characterize autoreactive T cells in diabetes-prone NOD mice, we have developed a multimeric MHC reagent with high affinity for the BDC-2.5 T cell receptor, which is reactive against a pancreatic autoantigen. A distinct population of T cells is detected in NOD mice that recognizes the same MHC/peptide target. These T cells are positively selected in the thymus at a surprisingly high frequency and exported to the periphery. They are activated specifically in the pancreatic LNs, demonstrating an autoimmune specificity that recapitulates that of the BDC-2.5 cell. These phenomena are also observed in mouse lines that share with NOD the H-2g7 MHC haplotype but carry diabetes-resistance background genes. Thus, a susceptible haplotype at the MHC seems to be the only element required for the selection and emergence of autoreactive T cells, without requiring other diabetogenic loci from the NOD genome. Biophysical and functional characterization of Ag7/2.5mi and Ag7/GPI MHC molecules. 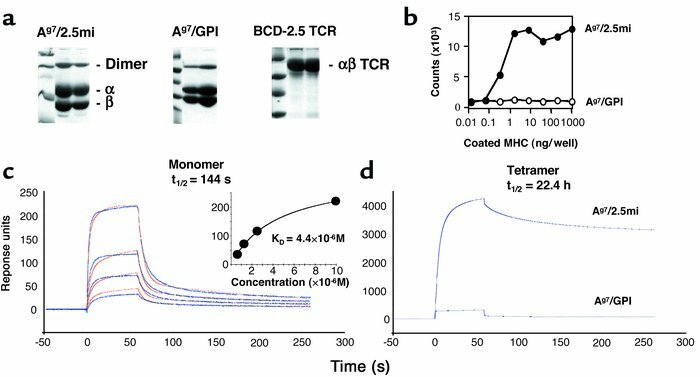 (a) SDS-PAGE analysis of the various recombinant MHC and TCR molecules used in this study. Molecules were purified from culture supernatants of transfected Drosophila melanogaster cells. The peak fractions of the final size exclusion chromatography are shown. (b) Recombinant Ag7/2.5mi molecules can activate the BDC-2.5 T cell hybridoma. Ag7/2.5mi MHC monomers were coated at the indicated concentrations into 96-well plates. IL-2 production was measured from the supernatants after 24 hours of culture. (c) Surface plasmon resonance analysis of the Ag7/2.5mi MHC/BDC-2.5 TCR interaction. Left: BDC-2.5 TCR molecules were randomly immobilized on a CM5 chip, and Ag7/2.5mi or Ag7/GPI (negative control) MHC molecules were flown over the surface. Subtracted curves are shown in blue lines, calculated curves in red. A Langmuir 1:1 binding model was used for analysis. Concentrations of injected MHC molecules were 10 μM, 2.5 μM, 1.25 μM, and 0.625 μM. The inset shows a steady-state analysis of the same interaction. (d) Tetramers of Ag7 with either peptide were flown over a high-density BDC-2.5 TCR surface. Unsubtracted curves corresponding to a tetramer concentration of 1 μM are presented.